We have received requests on Twitter from ardent fans of actors Digangana Suryavanshi and Vishal Vashishtha [Vishana], currently working in the lead role of Veera and Baldev respectively, to write an article in support for their casting as the lead couple in a new show. The most recent article on similar lines we wrote was for supporting Ek Boond Ishq [EBI] Season 2 with the same lead cast: Viraf and Chhavi. We find it much easier to write as EBI season 2 can be a natural extension, and even makers were interested to go for it. Nevertheless, we decide to pitch in this time as both Digangana and Vishal have been associated with Veera for a good amount of time (> 1 1/2 years), Veera bidding adieu soon, and moreover to give a shot for such a request from their fans. Let’s dvelve into Vishana’s fans request. They would like to see their loved pair being cast as the lead couple in a new show since Veera is confirmed to end in mid August 2015. Moreover, they will be glad if the current production house of Veera (Beyond Dreams, in short BD) casts them in their upcoming show. They are aware if only one of them is cast in BD’s upcoming show then they will be missing the couple very much due to their strong attachment with time So, they are also banking on the second option of seeing the pair together in a new show from other producers. Coming to the reasons behind fans’ support are: amazing chemistry between the pair, talent, connecting well with audience and appreciation, youth quotient. They also have the wish to see the pair as the only lead couple in a new show unlike in Veera, where there were two parallel leads. We’re also of the opinion that both Vishal and Digangana have left an impact on the audience with their convincing performance and screen presence. In particular, the audience have accepted Vishal as Baldev, whose character has gone through many transitions: good, grey, negative. So, there is wider scope for the pair to fit in different genres/themes. Also, Vishana’s fans have put up an online petition at change.org on wanting to see both Vishal and Digangana in Beyond Dream’s new show as a leading couple. As a reviewer or critic, we understand storylines and plot (during the telecast) far better than how the casting process, creative phase (and requirements, economics) go through before a new show finally comes on air. Also having little knowledge on actor’s preferences, commitments, and important decisions of his/her life in a fast paced and evolving Indian TV industry. But, nevertheless, at the end of the day any TV show is made for the fans or the audience as they are the end consumers so their inputs and requests need to be given timely attention. – Twitter pages of Vishal and Digangana. 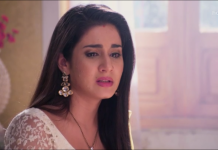 – Ek Veera Ki Ardaas… Veera on Star Plus, first episode telecast was on 29th October 2012. Veera’s Wikipedia page. yeah really amazing article.thanks alot for helping us..